Õpi tundma Hispaania kultuuri läbi etnograafiliste (rahvuslike) esemete. Partner: The activities aim at acquiring experience, knowledge in the field and promoting solidarity, coexistence and participation of the volunteers. 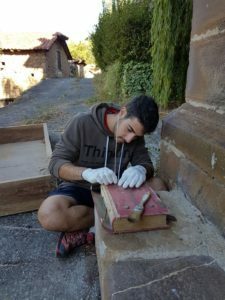 Work: Activities related to the intervention and conservation of the ethnographic objects from all over Cantabria, in virtue of the project submitted to the Directorate General for Youth and Directorate General for Culture. Accomodation and food: The place of accommodation and meals will be at Gerardo Diego Youth Hostel. Shared rooms with bunk beds (sleeping bags must be brought), showers and shared bathrooms, swimming pool, multisports court, multipurpose rooms. Meal service: breakfast, lunch,tea and dinner. Alternative menus for justified reasons are also provided. This option must be specified at the time of booking. There will be a picnic in outings and trips. Location and leisure: Solórzano is a municipality of the autonomous community of Cantabria (Spain) situated in the region of Trasmiera. The village is located in a valley run through by a not very abundant river called Campiazo. It is a nice and peaceful village, ancient nobiliary and royal estate, rich in mine sites and prehistoric caves. – full-day trip to Santander (capital of the autonomous community) and a beach, tourist or sport full-day trip.